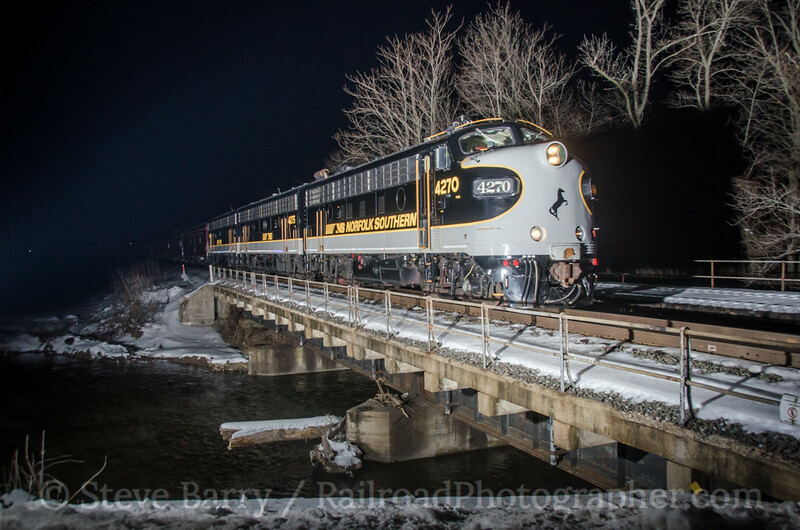 In a previous post we visited the Maryland Midland Railway on February 11, 2014, and had a run of good luck -- we caught locomotives in old and new paint schemes on two different trains. But that wasn't the complete story of the day. The good luck continued into the evening. At the conclusion of the Maryland Midland chase my brother Bruce and I headed up into Pennsylvania to Norfolk Southern's Lurgan line, which heads southwest out of Harrisburg. Our goal was to get a night shot of a southbound train crossing the through truss bridge over Yellow Breeches Creek near Boiling Springs. The creek makes a horseshoe just east of town while the tracks go straight, and southbounds/westbounds cross a deck bridge and the through truss bridge in quick succession. The line can be viewed on ATCS Monitor (a computer program that lets you see a simulated dispatcher's display of the railroad) and once we arrived at Boiling Springs we checked that. Alas, only an eastbound was coming. Looking for other targets, we called up heritage units.com to see if any of Norfolk Southern's heritage units would be in the Harrisburg area. The only thing showing was the Norfolk Southern business train led by FP7 No. 4270 -- on the Lurgan line heading east! Our eastbound train was the business train! We quickly relocated to the eastern deck bridge for the shot and were soon rewarded by the sound of horns. A few minutes later, we snapped our photo and put the cherry on top of what was an extraordinarily lucky day.